At least 12 people, including an officer, were killed late Wednesday when a gunman opened fire in a packed Southern California bar during its "college night," leaving the community of Thousand Oaks in shock and in mourning. The lone suspect, 28-year-old Ian David Long, was found dead inside the Borderline Bar & Grill after the overnight shooting, Ventura County Sheriff Geoff Dean said. Authorities believe he shot himself. Long was a U.S. Marine Corps veteran, Dean said. Ventura County Sgt. Ron Helus, a 29-year veteran, was killed in the line of duty, Dean said. He was one of the first on the scene and was shot multiple times when he entered the bar, authorities said. Helus, 54, survived by his wife and son, was looking to retire soon, the sheriff's office said. Instead, he made "the ultimate sacrifice," Dean said. "Hey, I got to go handle a call, I love you," Helus told his wife, according to Dean. Dean told ABC News' David Muir that he spent a lot of time with Helus and that they worked out at the same gym, where the sergeant would visit "with everybody." "He's a good guy," Dean said. "...He's friendly, he's happy, he just wants to talk and be personable and help people out. He's helped a couple of the employees in there get hired as deputies." Also among the dead is 22-year-old Cody Coffman, his father, Jason Coffman, overcome with emotion, told reporters. "I talked to him last night before he headed out the door," Jason Coffman said. "First thing I said was, 'Please don't drink and drive.' Last thing I said was, 'Son, I love you.'" "I am speechless and heartbroken," he said. "I cannot believe that it's happened to my family." "I just want him to know that he is going to be missed," Jason Coffman said of his oldest child in between tears. Another victim was Pepperdine University student Alaina Housley, niece of Adam Housley and "Sister, Sister" actress Tamera Mowry-Housley. "Our hearts are broken," Adam Housley and Tamera Mowry-Housley said in a statement. "Alaina was an incredible young woman with so much life ahead of her and we are devastated that her life was cut short in this manner." Marine Corps veteran Dan Manrique, died in the shooting, Jacklyn Pieper, athletic director for the Ventura County Chapter of Team Red White & Blue, told ABC News. Manrique was the chapter captain for the organization. Telemachus Orfanos also died in the shooting, his mother told San Francisco ABC station KGO. Orfanos was in attendance at the country music festival in Las Vegas where 59 people were killed last October. "My son was in Las Vegas with a lot of his friends and he came home," Susan Orfanos said. "He didn't come home last night, and I don't want prayers. I don't want thoughts. I want gun control, and I hope to God nobody sends me anymore prayers. I want gun control. No more guns." Justin Meek, 23, also died, according to Thousand Oaks' California Lutheran University, from which he had recently graduated. "Meek heroically saved lives" during the massacre, the university said. "Cal Lutheran wraps its arms around the Meek family and other families, and around every member of this community," the university said. Noel Sparks and Blake Dingman, both 21, were also victims of the shooting, ABC News confirmed. Among those inside were six off-duty police officers, who reportedly "stood in front of my daughter" to protect her after the gunfire rang out, one parent told the sheriff. She said multiple men around her blocked the group with their bodies, "ready to take a bullet for every single one of us." "As soon as we all saw that, we jumped up," she said. "I ran out the front door, down some stairs, face-planted in the parking lot but I was lucky enough to get out alive." Thirteen people with gunshot wounds or lacerations were treated and released from local hospitals. As the sun rose Thursday, women as young as 18 years old emerged from the area surrounding the bar. Many were dressed in cowboy boots and flannels and draped in pink blankets given to them by authorities. They clung to each other, desperate to find missing friends. Terrified parents also descended on the area. One mother was so frantic that she jumped out of the passenger side of a still-moving car to race toward the crime scene. As parents waited outside, they "pinged" their children's phones, some of which were left buzzing inside the bar. "We're just praying for our friends that we haven't heard from," DeSon told "GMA." "You never think it's going to be you until it happens. This is a problem. This is real and it's awful." Thousand Oaks ranked third in America's safest cities this year, according to Niche, a Pittsburgh-based company that researches neighborhoods and schools across the country based on public data as well as resident reviews. "I love this place -- it's our usual hangout," college student Erika Sigman said of the Borderline Bar to ABC Los Angeles station KABC. "My parents trust me going here." Meanwhile, investigators are working to determine the suspect's motive. There's no apparent connection between Long and the Borderline Bar, the sheriff said. Long served in the Marine Corps from 2008 to 2013. He served in Afghanistan from November 2010 to June 2011. Long lived near Thousand Oaks in the town of Newbury Park. Neighbors told ABC News that he lived with his mother and rarely went outside. 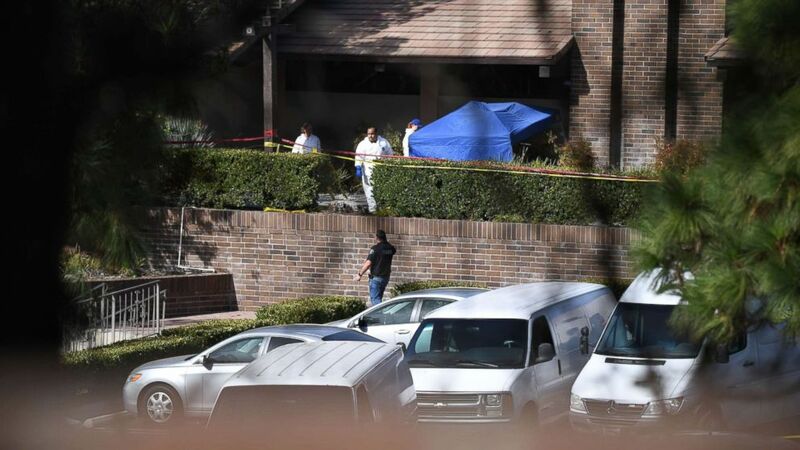 There are no indicators of any additional associates or other threats to the Los Angeles area, Paul Delacourt, assistant director of the FBI's Los Angeles office, said in a press conference Thursday afternoon. Investigators are searching Long's vehicle and his home to "paint a picture on the frame of mind on the subject." This April deputies were called to his home for a report of "subject disturbing" and found Long "somewhat irate," said Dean. Mental health specialists met with him, Dean said; however, they "didn't feel that he was qualified" for involuntary psychiatric commitment. President Donald Trump has ordered flags to be flown at half-staff until Saturday at sunset "as a mark of solemn respect for the victims," he said in a proclamation. ABC News' Will Carr, Will Gretsky, Julia Jacobo, Katie Kindelan, Josh Margolin, Morgan Winsor and Elizabeth Mclaughlin contributed reporting.